There were delightful positive responses to my last post on the Random Poncho. Thank you! The question asked by several readers was about the size of the poncho. I posted another poncho over a year ago, and being a different size, I thought I would show a comparison. I once made a poncho that draped within 6″ of the floor! I sold that one and never took a photo, but I believe the longer the drape, the more elegant the look, however the shorter versions are more practical. This alpaca poncho is my constant companion around the house, running errands, and even to dinner to fight off a chill in the air. It fits in my purse so I can easily take it along. 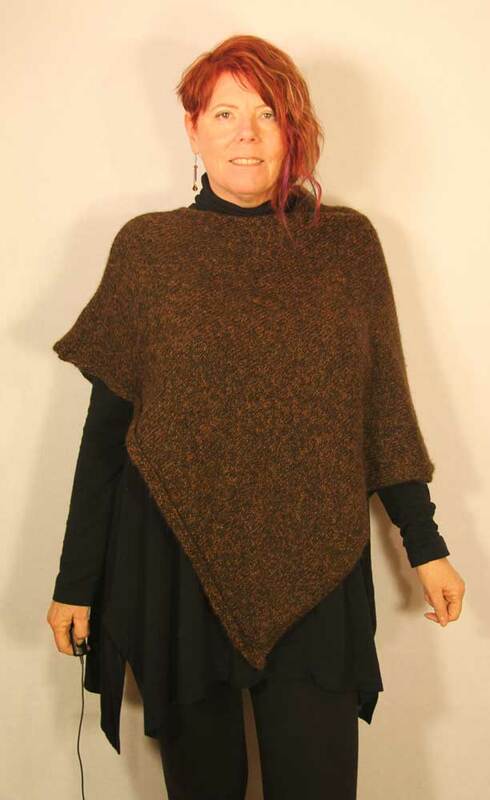 Smaller than last weeks poncho, the dimensions are a 25″ x 50″ rectangle with a 13″ neck opening. This wrap never gets in my way so I can wear it while working. 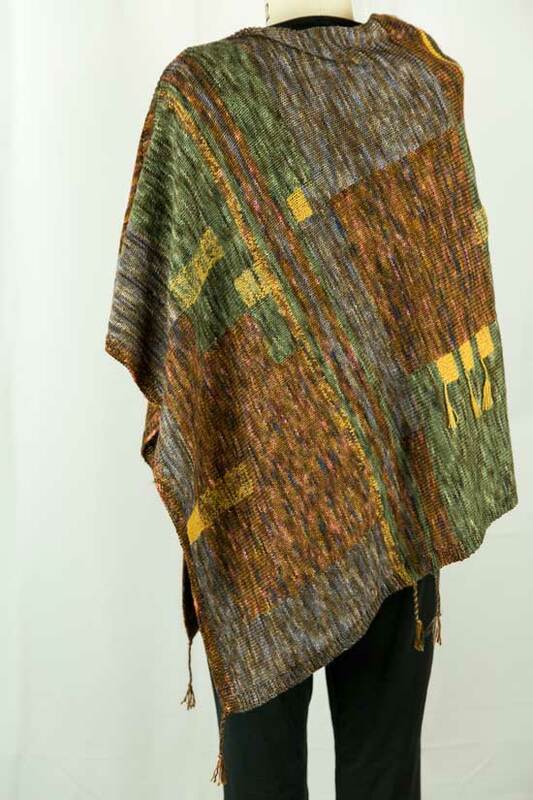 The Random Poncho is a 28″ x 56″ rectangle folded in half. The neck edge is the stitched side so it is also 28″ long when folded. I left a 13″ neck opening (that number works for me) and stitched together the remaining 15″. I started with 8 rows of garter stitch, before the main rows that are 8 stitches in stockinette on each end to give a nice edge. I think the stockinette edge also looks good at the neck and on the shoulder seam. Both of these ponchos are asymmetrical when worn. I like the point hanging down one leg, but if you want symmetry, you would add the folded edge length to the neck opening. In other words, the rectangle in this case would be 28″ in width but the length would be 13″ for the neck + 28″=41″ then of course doubled so a knitted dimension of 28″ x 82″ before folding and seaming. The bottom point would swing down between the legs and the whole poncho would be longer. Ok, I admit it, I’m a poncho nerd! I’m in Bar Harbor, Maine next week, but hope to come back to my clean studio and start back into my fall sewing! I finished my first accessory for fall travel to Rome and Italy! Taking my chosen color swatches I went to The Loopy Ewe and picked out four skeins of yarn. Three are Hedgehog fibers sock yarn and the gold is ShibuiKnits Pebble. I wanted to make a shawl or poncho, but I just couldn’t decide. Making a swatch of the knitted fabric didn’t help solve the question. 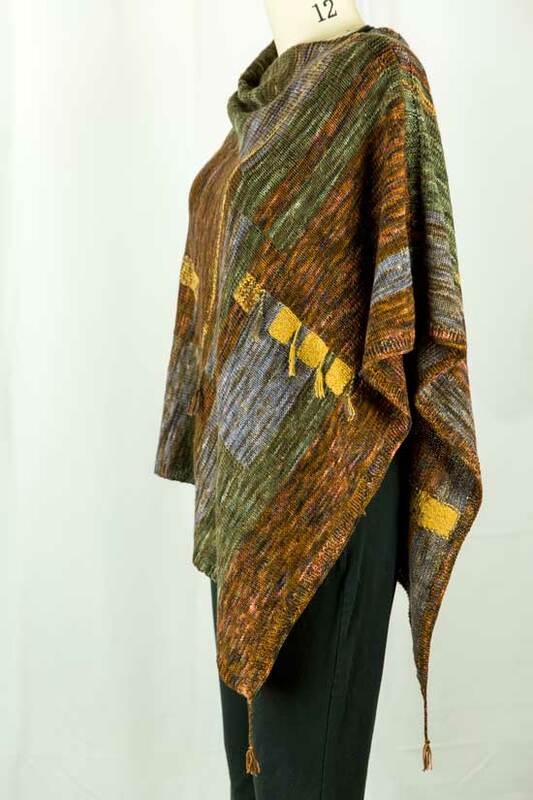 A shawl that would have good dimensions as a poncho was the temporary answer and as you see the poncho won out in the end. 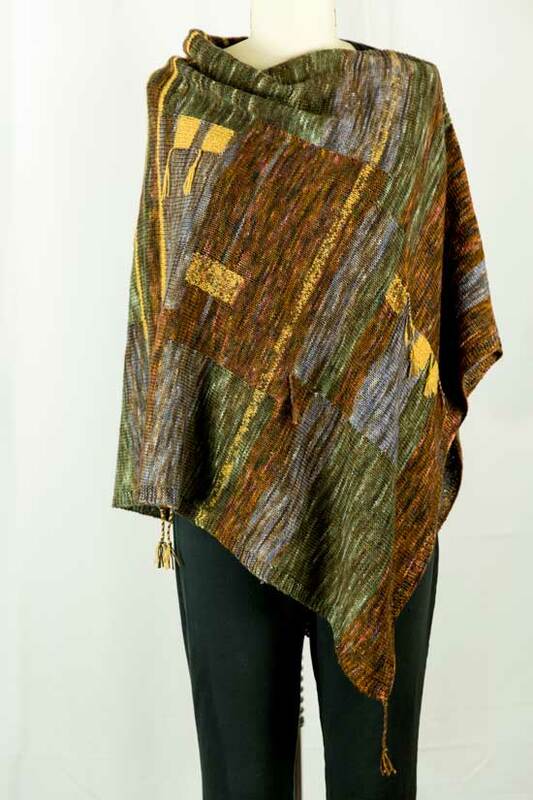 Ponchos can be worn as a scarf but are also cozy and easy to keep track of during travel. The pattern is my own and completely random! I’m kind of a math geek and love the idea of randomness. You almost have to put your brain outside of the project and just knit. I started out and knitted the rust color until I was bored with it. Then I divided the piece into 3 sections and knit with the main colors. At that point the knitting looked a little bland so I started a stripe of yellow. The four colors were getting all tangled up so I stopped the yellow as it became a square. That gave me the yellow square motifs. The other bit of randomness are the tassels. I had a million (I tend to exaggerate) ends to weave in, and thought why do we always have to weave them in? Aren’t there other options? Yes some of them are tassels! Randomly placed of course. A girlfriend and I are going to Anderson Ranch for art classes this week. I’m looking forward to the cool days in Snowmass Village, Colorado. I might even try to blog with my iPad if I find a few minutes. I need to start practicing for my Europe trip with the Tilton sisters. This top ended up a bit warmer than I had anticipated, but it will be welcome on a cooler summer day or evening. My BSF and I decided to try Katherine Tilton’s Butterick 6136 because we both like princess seam lines for flattery and fit. 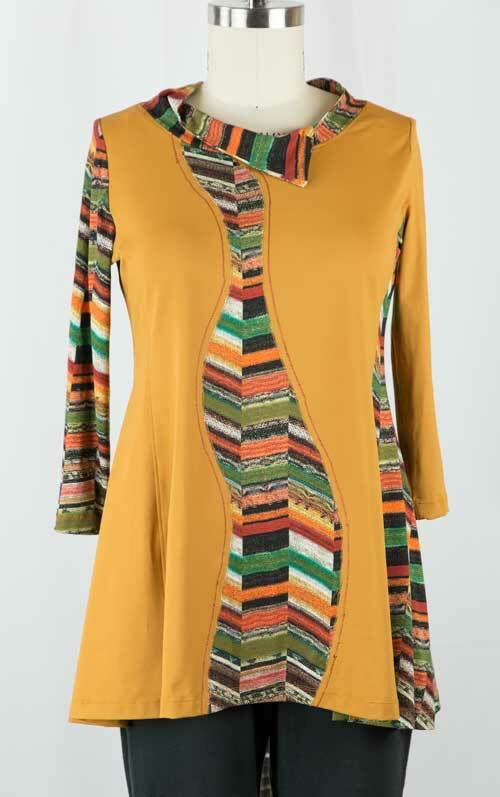 The decorative topstitch lines on the pattern are also a terrific idea for adding extra detail to a plain tunic. We made quite a number of modifications to the pattern. The biggest was a change to the armscye and sleeve, since it was too generous for our taste. We used one of our TNT’s Vogue 8952 (view B) thereby producing a closer fit. We’re both getting more comfortable with changing patterns in this way to get exactly what we envision. I took Katherine Tilton’s simple yet brilliant idea of decorative topstitching, but didn’t follow her exact pattern. 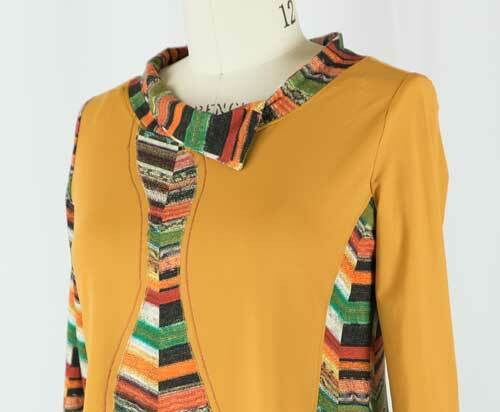 A thin ribbon attached with a zigzag stitch created a bolder line, but the top still seemed plain. It sat on Roxie for several days without the side seams, since I knew there was something I wanted to do. Finally I took a scrap of the patterned knit and draped it down the front between the two topstitch lines. Big improvement, and easy to do! 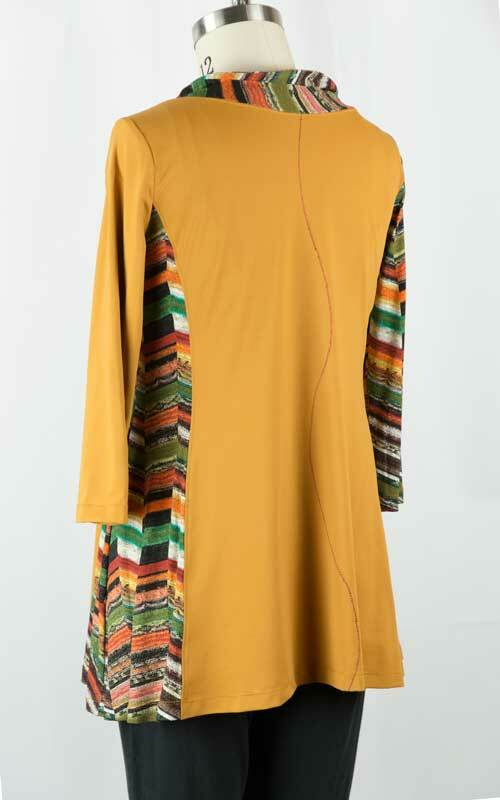 Finshing the top included a wedge-shaped collar that used previously on this Marcy Tilton dress. This time I tucked the short end under the long to give a little lift. This is such an easy collar finish. That leads me to a question. I’m taking more time sewing these days in order to concentrate on details like the collar, and this is leading to fewer posts. Would my readers like some photos of work in progress, exposing more mishaps, fixes and other details? Let me know if you just want to see the finished product or more process.